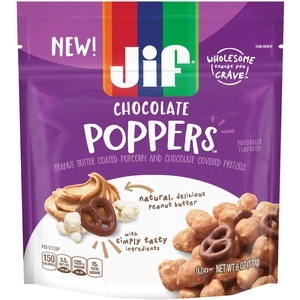 Jif Chocolate Poppers deliver layers of flavor and texture with natural, delicious peanut butter and simply tasty ingredients. Peanut butter-coated popcorn and chocolate-covered pretzels come in a resealable pouch that makes it great for on-the-go. They are a good balance of wholesome and delicious. Cravable snack makes you feel good about eating.